Create you own ST2E Card-Review! The Card-Review is the classical article to discuss the advantages and disadvantages of a single card. Possible questions are how you could combine the review card with other cards or how this card fits the strategy of your next deck (use riter "New"). When you finish your article the text and picture of the review card are automatically added as openCards service to your review! The ST2E Card-Review database contains all ever on openCards published Card-Reviews and is searchable by several criterias like card name, card typ, expansion the card belongs to, author of the review, review title and even a part of the review text (use riter "Search"). 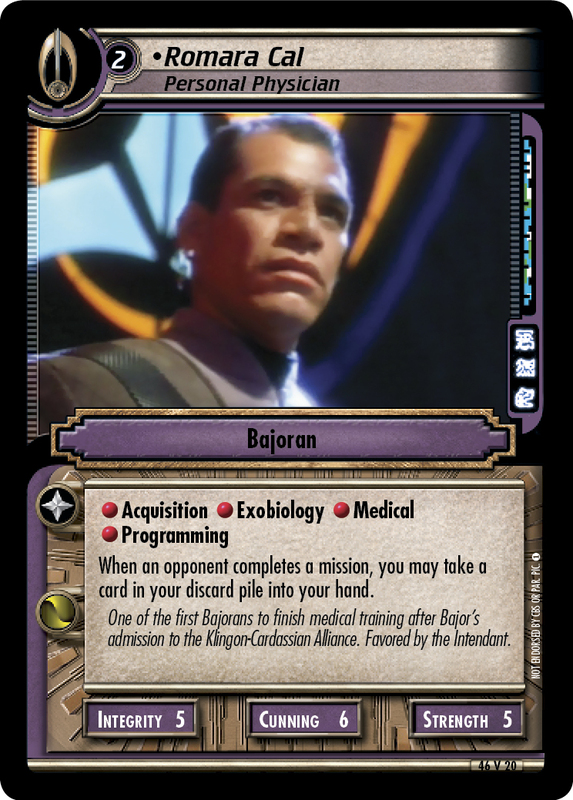 This Card-Review article was written by Ross Fertel and was published first on "The Continuing Committee (trekcc.org)" at Dec 5th, 2018. ﻿﻿Every month this year, I’ve posted a Blog on something related to Second Edition. Sometimes it’s a behind the scenes story, sometimes I look back at a set and sometimes I might even reveal a spoiler. I’m cross posting this month’s entry here. Way back when I was a Resident Assistant in college, my boss told me about her time on a recruitment committee. Part of the job involved traveling to job conferences to interview perspective staff members. There was a particular job fair that unofficially required the hiring company to decorate their provided room with paraphernalia from the school. She told me specifically that she was walking around with her boss who said “Those blankets look nice.” She took the hint and those $98 blankets were approved on the total budget but the $2 untippable mug? Not so much. This Card-Review article was written by Ross Fertel and was published first on "The Continuing Committee (trekcc.org)" at Nov 30th, 2018. There are three themes in Shattered Mirror. Two have been revealed in several previews in various venues. They are the Mirror Universe being introduced as a stand-alone headquarters and the Klingons getting a chance in the spotlight of an expansion. There is a third theme appearing in Shattered Mirror. Though more of a sub theme in volume, the pitch was events or personnel that get activated when a mission is solved by your opponent. Think of Soft Sell which plays on an incomplete mission and when it’s solved, stuff happens. Think of Duras, Son of a Traitor who is at a mission when solved can kill a solver of their choice. Consider them to be Duras Bombs. What's a Girl Gotta Do to Get to the Mirror Universe? 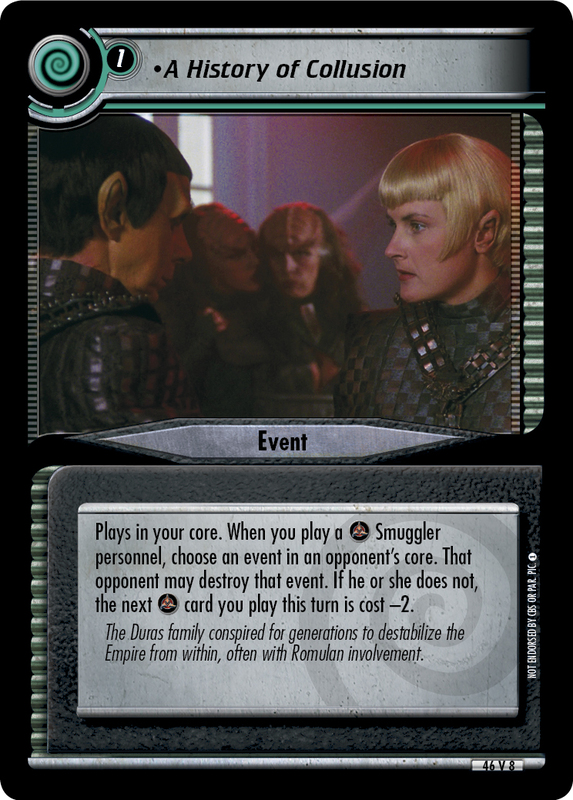 This Card-Review article was written by Maggie Geppert and was published first on "The Continuing Committee (trekcc.org)" at Nov 23rd, 2018. ﻿﻿﻿﻿﻿The Mirror Universe is fairly well fleshed out in First Edition. You can easily play in a variety of forms: Mirror , or . 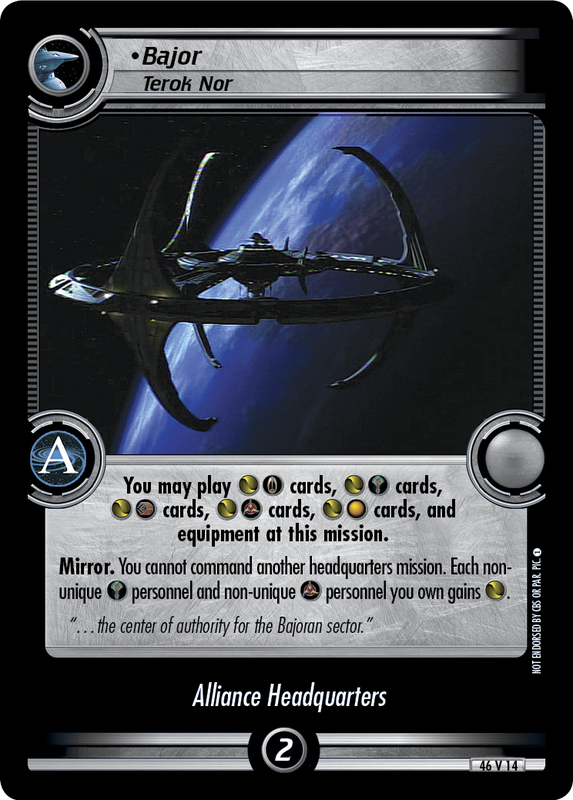 In Second Edition it’s also quite easy to play Mirror Universe factions such as Starfleet or the Terran Empire, because they are simply variants on the or affiliations and play to their existing headquarters. However, this has not been the case for the Klingon-Cardassian alliance. In fact, this deck has been relegated to the status of one of my “Cool” decks for a couple of years now. It requires you to play three headquarters (Mouth of the Wormhole, Deep Space 9, Qo'noS, Heart of the Empire and Cardassia Prime, Hardscrabble World) and lots of Multidimensional Transporter Devices (assisted by Souls of the Dead) to get your personnel in play. Due to the triple HQ, you have to play two 50 point missions to get a win, which is always a tricky proposition.